Nexans Euromold cable jointers tools sets are used for preparing 11kV and 33kV medium voltage power cables with XLPE insulation and bonded semi conductive screens – recommended for stripping MV cables up to 33kV to enable the installation of Euromold separable connectors. Medium voltage cable jointers tool kits are available in two sets (Nexans CPTK1 | CPTK2) and both are supplied in a hard wearing, foam filled case protecting the cable jointing tools from site damage and ensuring longevity of the tool sets. Please note all cable jointing tools can be purchased separately if required. 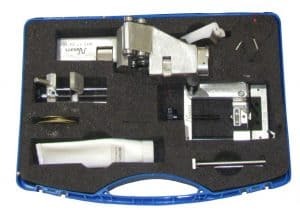 Nexans P20 peeling tool is used to remove the extruded outer semi conductive cable screen of MV cables with an over core insulation diameter between 10-50mm. An adjustable v-plate guide allows for different stripping speeds and include a radial screen cut for medium voltage power cables. The blade cutting depth can be fixed which is particularly useful when preparing the same cables offering a smooth and faultless finish every time. 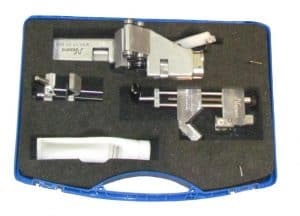 Nexans Rheycut II peeling tool removes outer semi conductive cable screen on medium voltage cables with an over core insulation diameter between 15-60mm and can be used with or without length control. 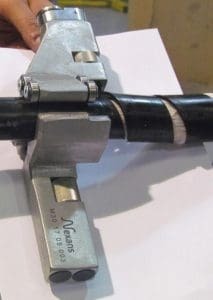 Using the jointers tool without the length control permits the semi-con layer to be removed up to a length of 25mm measured from the cut-off edge of the outer cable sheath. 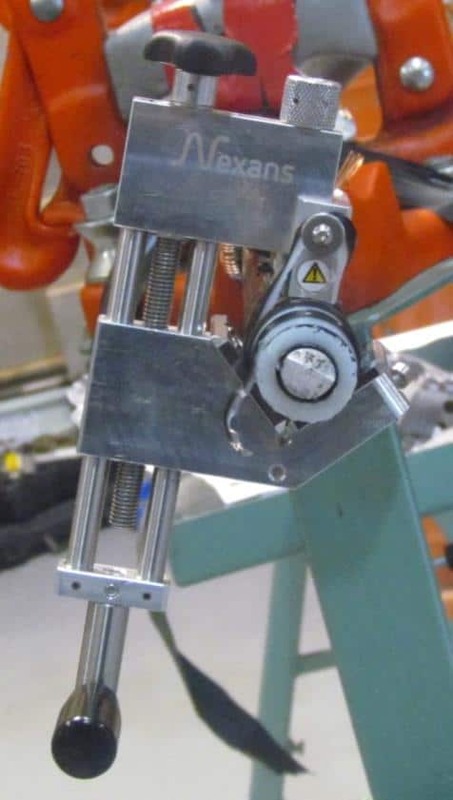 Nexans chamfering tool removes sharp edges at the cut-off edge of cable insulation to ease installation of slip-on or cold shrink joints and accessories for cables with XLPE insulation, diameters from 15-60mm. 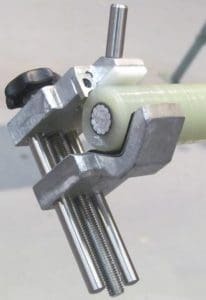 A specially formed blade provides a 35 degree chamfer radius at the cut-off edge which reduces the force required to install non-size sensitive slip-on cable joints and terminations, typically at 33kV. 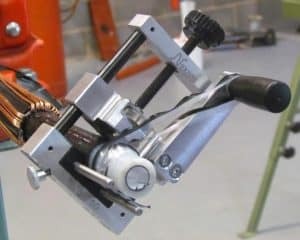 M30 cable sheath and XLPE insulation cutting tool can be used to remove the outer cable sheath/jacket and polymeric insulation with a diameter from 20-70mm (20-31mm when using the plastic insert) – can also provide spiral cutting or circumferential cutting of 11kV/33kV cables. The cutting blade of the M30 cable tool has an adjustable cutting depth and is able to cut wall thicknesses up to 14mm and is specially formed with a guiding system lifting the material to avoid damaging cable layers underneath. ➡ View the complete range of MV & HV Jointing Tools.